We’d love your help. Let us know what’s wrong with this preview of Betrayal by Lavinia Urban. This is a fast paced young adult paranormal read. I loved the constant human factors that comes to play in this book. Erin is not perfect, her younger sister is the athletic pretty girl but when they need to be a family they are. Once all starts to unfold it becomes obvious that this family will stick together and even after the main male protagonist is introduced he falls in with their family dvd nights on Friday. Sean is the perfect boy and their love is what keeps balance…. but Sean is not al This is a fast paced young adult paranormal read. I loved the constant human factors that comes to play in this book. Erin is not perfect, her younger sister is the athletic pretty girl but when they need to be a family they are. Once all starts to unfold it becomes obvious that this family will stick together and even after the main male protagonist is introduced he falls in with their family dvd nights on Friday. Sean is the perfect boy and their love is what keeps balance…. but Sean is not alone. This is a fast fun read. One I enjoyed very much. 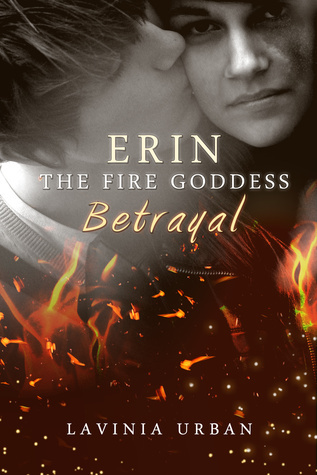 "Erin the Fire Goddess: Betrayal" by Lavinia Urban is a nice follow up to the first book in the series. Back at school, our heroine Erin has a slightly easier time than before. She is happily in love with Sean and is also making friends with some other kids with super powers. Far from a regular super hero again the focus is on the emotional development of the characters and their relationships and their coming of age. There are some mysteries to be solved though and life is not completely free o "Erin the Fire Goddess: Betrayal" by Lavinia Urban is a nice follow up to the first book in the series. Back at school, our heroine Erin has a slightly easier time than before. She is happily in love with Sean and is also making friends with some other kids with super powers. Far from a regular super hero again the focus is on the emotional development of the characters and their relationships and their coming of age. There are some mysteries to be solved though and life is not completely free of complications: Jealousy comes in the way of love and some secrets are to be revealed. After a long build up the story takes some surprising turns at the end and leaves you breathless and amazed. Like its predecessor the book does a great job at portraying teenage angst and problems, the use of super powers is incorporated in a simple way and does not lead to revenge or comic strip quality but aides the entertainment value and the plot development in other ways. I won't say more than that! It was another fabulous part of this great series. The story is one you can't helped but getting wrapped up in! Erin and Sean are just amazing. That tramp ugh wanted to knocked her head off! There was so much revealed and so much more that I need to know! I will admit the ending left my mouth wide open but, I am ok with that!! I was given book by author for an honest review. Another R2R for this book and I couldn't be happier to do it. When we last left Erin, life was looking good and it seemed that things were finally looking up for our fire girl. Unfortunately, there has to be conflict or the story wont go anywhere. That's where Louise comes in and the drama begins. As much as I liked the first book, I love this one even more, but I wished it hadn't ended so abruptly. I wanted to keep on reading. I shall not wait impatiently until the next book. This review has been hidden because it contains spoilers. To view it, click here. I received this book in exchange for my honest review. This book was just as great as the first one, if not better. It’s not so sad as The Beginning, you laugh more and you can sense the happiness around the characters. Erin finally has her a great life, everything has fallen into places. She has her soul mate Sean who loves and adores her, her birth mark has disappear, and she has wonderful friends. She is kind of popular this book, makes new friends, the sisters Charley and Kody who have specia I received this book in exchange for my honest review. Erin finally has her a great life, everything has fallen into places. She has her soul mate Sean who loves and adores her, her birth mark has disappear, and she has wonderful friends. She is kind of popular this book, makes new friends, the sisters Charley and Kody who have special powers like her. Erin doesn't feel like a freak anymore, she is more confident and walks with her chin up. “I love you,” Sean lovingly told me as he stroked my stomach. “I love you too,” I smiled. I don’t think I could get any happier as he leaned over to kiss me. We have another love story in this book, one between Kasey-ray and Justin. They’re love is pure and they feel like they were meant to be. The problem is, Justin started the University and now they can’t see each other so much, only in weekends. They have a rough start, but I have a feeling they will make it through. Justin even made the courage to ask Erin for permission to date her sister. I love how she protects her little sister, and thinks before acting. Even if she has a problem with Justin, she gave him a chance. “Why Kasey-ray?” This seemed to brighten him up. “She is amazing!” He gave me the biggest smile I’d ever seen him wear. “There is something about her that makes me want to come back for more. I hate being away from her.” I could tell he meant it. When I thought finally everything will be fine, a new girl comes in the scene, Louise. She is beautiful, smart, her aunt owns the new flower shop, and she can have any boy she wants. She tries to become friends with Erin and her sister, but the, she spots Sean and that’s the men she wants. She doesn't care that he is Erin’s boyfriend, she wants him and she will do anything. “Oh Erin, you didn't tell me this lovely gentleman was your boyfriend,” she purred, and I didn't like the way she lingered on the word ‘was’. “You never asked,” I snapped. Sean instantly sensed hostility and moved his chair closer to mine. This story kept me on my toes,I simply love a good book! The last pages almost made me cry, and I was wondering why Erin isn't doing anything to her, but I think, in the end she made the smart decision and the best. It left me wanting more and I can’t wait for the next installment. I’m curious what will happen with Erin and Sean, and what will happen with Louise and the rest of the characters. Lavinia Urban did it again with this book, she is amazing! I recommend you read this series! It has everything, it’s a great series! An eventful summer with Sean, Kelly and the twins is quickly over. Erin is still learning to control the fire within. Kasey-Ray has fallen in love with Sean's friend, Justin, and learns she too has a special power. Her great-grandmother's missing diary mysteriously falls from the shelves one afternoon courtesy of an invisible man. Reading from the diary, Sean and Erin learn not everyone in Galladale is who they seem to be. School has started and change is in the air. The birthmark that has staine An eventful summer with Sean, Kelly and the twins is quickly over. Erin is still learning to control the fire within. Kasey-Ray has fallen in love with Sean's friend, Justin, and learns she too has a special power. Her great-grandmother's missing diary mysteriously falls from the shelves one afternoon courtesy of an invisible man. Reading from the diary, Sean and Erin learn not everyone in Galladale is who they seem to be. School has started and change is in the air. The birthmark that has stained the left side of Erin's face has nearly disappeared. So much so that now classmates are talking to her instead of taunting her. Two new students help end another classmates jealous confrontation with Kasey-Ray. In the course of things, they each reveal their own secret abilities and friendship blossoms. But what good is a story without some kind of conflict. Urban comes through again in flying colors in the person of Louise Clarke. A new girl in school who claims she can have anyone she wants, Louise sets out to prove it during lunch one day, not caring that the boy she uses to prove her point is already in a relationship. Now she has her sights set on the one boy who doesn't want her, determined to take Sean away from Erin. The final year in school brings surprises and reveals long held, painful secrets. Why does Erin feel she can trust the invisible man when he finally reveals himself? Why does Sean not trust him? How far will Louise go and can Erin stop her? Overall: The romance between Erin and Sean was still electric and steamy. It seemed like the closer they became the more they were able to read and understand each other. Our villain i have to say was a little on the tame side compared to Jessica in the last book. I expected Louise to be a little more aggressive towards Sean, but maybe everything has a reason. I am still very unsure about Dr. Hammersmith's and Scott's characters. I just feel like they are a WAY bigger part of the story than we know and i can't wait to see how things unfold. I still can't believe what they revealed about him. How old is this guy really? I only have two negatives about the book. #1 Sometimes I felt a little lost on what was going on. For me there was to many details in certain spots in the book and not enough in the other. #2 I wish that I could've been able to "read" more of the journal instead of having them explain things to me. I feel like that would've made things more interesting. Side Note: I really like the 2 new girl characters, but just as everyone is getting close ... BAM the mom's see each other. I wonder where their story is going to go. Overall this was a very good book and i would recommend it to everyone. Series Cont: After that ending .. it better! =) Yes it Does! I felt like a lunker bass while reading Lavinia Urban's second (I think) novel, “Erin the Fire Goddess – Betrayal”. First, she dangled some bait in front of me – in the form of a prologue (which, like most prologues I have read, comes totally out of left field but eventually gets explained in the novel) and a quick introduction to the characters of the novel (which I read about in the first book, but it's been long enough that I needed the refresher). She starts slow – has trouble getting and ma I felt like a lunker bass while reading Lavinia Urban's second (I think) novel, “Erin the Fire Goddess – Betrayal”. First, she dangled some bait in front of me – in the form of a prologue (which, like most prologues I have read, comes totally out of left field but eventually gets explained in the novel) and a quick introduction to the characters of the novel (which I read about in the first book, but it's been long enough that I needed the refresher). She starts slow – has trouble getting and maintaining my attention, BUT keeps me alert enough to want to stick around. Little by little, that tease of bait that we started with seems to want more and more of my attention, distracting me from everything else – including the hook buried within – until … WHAM!! She's got me!! AND … there's enough hanging plot threads at the end of the book to cause me to want to move on to Book 3 (but without so many that I feel cheated in that I didn't get a full novel out of this book). Without giving away the plot, Erin discovered in the first novel that she has some kind of power over flame. In this novel, she learns more about it, and about others who have their own powers. It's aimed at a YA audience, - let's call it a paranormal romance just a step above chaste – but many adults freely admit to enjoying that genre, as well. Ms. Urban, I cannot use the word love. BUT I really really liked your book, and I want to see it (or rather, its sequel) again. WOW! Where do I start? I give this book 5 stars, wish I could give it more. Even with the grammer mistakes it was still an awesome read. The storyline was amazing and the characters very well developed. Erin's life is finally falling into place. Last year of school, her birthmark is slowly disappearing, she has her soulmate Sean, and she is finally happy with ,ife and all it has to offer. Her sister Kasey-Ray has a new love in her life I received this book from the author to give an honest review. Her sister Kasey-Ray has a new love in her life and something that makes her unique. Which will be revealed. The talk between Erin and her mother and birth control when her mom catches Sean in Erin's bed. The other funny part was when Justin used his powers on Paul, and made him say he liked men, The whole snippet on that part was a good chuckle. There are new characters introduced and a surprise that you will not see coming. When a new girl comes to town she stirs up some trouble, and Erin sees through her and is not backing down. The ending came too quickly for me. Where the author left off, I so wanted to read more. What is going to happen with Sean and Erin? What is up with the new girl? Again, the story is amazing! Erin has finally settled into her new role, having friends, and getting used to her powers. She's trying to make peace with Justin, especially now that he and her sister Kasey-rae are in love. A new girl at school, who apparently has the power of manipulation, has set her sights on Sean, and the tension it causes is understandable after her display of stealing a boy at school right off his girlfriend's lips. More new friends with powers confirm Louise's intentions, b Again, the story is amazing! Erin has finally settled into her new role, having friends, and getting used to her powers. She's trying to make peace with Justin, especially now that he and her sister Kasey-rae are in love. A new girl at school, who apparently has the power of manipulation, has set her sights on Sean, and the tension it causes is understandable after her display of stealing a boy at school right off his girlfriend's lips. More new friends with powers confirm Louise's intentions, but the friendship is short lived when they learn the girls' aunt was the victim of Erin's mom's test from the evil Dr. The new school year begins, and Erin has suddenly become more popular. All the students believe she has had laser treatment on her birthmark and that’s fine by her, even though it does highlight just how shallow they are! Sean is as attentive as ever and even Kasey-Ray and Justin share a little romance. It is not all plain sailing though, once Louise, a new girl in town, shows up and decides that Sean is the boy for her, things get a little tetchy! ‘Betrayal’ follows on nicely from ‘The Beginning’, a few new characters are introduced and we learn quite a lot of family history from Erin’s Grans journal, which helps us to understand things a little better. Besides the fact that this group have ‘special powers’ they still have to deal with the normal teenage angst, so it goes to show that even super hero’s don’t always have it easy!! Lavinia Urban has an interesting tale to tell and it isn’t over yet, there are still a lot of questions gone unanswered here. Unfortunately just like book one the typo’s and erratic punctuation let the book down ……. now I’m hopeless at punctuation but even I can see that it needs work. In my opinion a good editor could polish and tighten this book up improving its readability and expanding its market potential, so I hope Lavinia considers that an option in the future. REVIEW: I started off reading this book, with a lot of questions. This was because, the way the first book ended, was perfect, which left no ideas to the readers, as to where Urban would take Erin next. To say the least, I was thoroughly impressed. There was a lot of drama, and jealousy, which I loved! Also, and I hardly say this, the villain from the previous book, Dr. Hammersmith, was explored quite nicely in Betrayal. I always admire that in an author- the ability to tell di Rating- 4.1 STARS! I was given this book as a gift in exchange for an honest review. To start off, I have to applaud Lavinia for originality. Never had I read a story close to Erin’s. Immediately I was drawn to Erin because of her imperfections. It’s the flaws that bring out the inner beauty in this lead character that makes me want to read on. The mysterious facial birthmark has a rich family history that draws multiple inquiries as to what Erin’s ultimate role is. This poor outsider of a girl is constantly trying to fit in while being bullied and assaulted by her peers at this new school. Erin eventually meets a group of kids who harbor the same secrets as her which is the ability to control the elements. She is instantly drawn to Sean who is immediately likable. The love that he has for her is like no other. Lavinia does a stellar job on illustrating their strong bond. I’m so excited to read the prequel to see what transpires with these two. Lavinia is not only a good story teller she is also an excellent writer. Very happy with the book and will recommend it to my friends for a fun quick read. This review may have some spoilers for those of who that haven't read book one. Honestly if you havent read book one you should be ashamed of yourselves!! Go, on and save yourself the agony and buy it. This is the second book in the Erin trilogy, and it picks up directly where book one had left off. We find Erin still coming to grips with learning that she has been given these extra powers to mold and create fire. Other than that lit I was given this as an ebook by the author for an honest review. This was a gift from the awesome author. This book has many twits and turns,laughs and tears. Many new characters and new powers. Without out giving too many spoilers, here is my take take on the book. Erin finds a diary of her great grandmother. She keeps it hid from her parents. Erin finds out a lot about the powers and what happens if a child does not find theirs. Casey-Ray and Matt breaks up and her also called best friend and Matt start dating,which is ok with Kasey-Ray, This was a gift from the awesome author. Casey-Ray and Matt breaks up and her also called best friend and Matt start dating,which is ok with Kasey-Ray,because she said they are both self centered and deserve each other. Erin is bound and determined to find the kid that has telepathic powers and help them realize before it is too late. New girls in town and in school and one of them is bound and determined to get the guy she wants.....SEAN!!!!! Omg this is a must have and best read of the series yet. I can not wait to get reading the next book in the series. I need to find out more. I highly recommend this book. The author is awesome at what she does and she brings you into the story. Imagine going through life as a teenager with what feels like a disfigurement. Every gawks when you come by and cruel kids make fun of you. Meet Erin and this is her story. Erin has a huge birthmark that takes up most of her cheek. She has been ridiculed her whole life about it and as her family moves away she is excited to leave the cruel kids in her school behind. Only, it's not as Erin had hoped. She has a new rival and she's not even sure why. Enter Jessica, the big, bad, bully that torments Imagine going through life as a teenager with what feels like a disfigurement. Every gawks when you come by and cruel kids make fun of you. Meet Erin and this is her story. Erin has a huge birthmark that takes up most of her cheek. She has been ridiculed her whole life about it and as her family moves away she is excited to leave the cruel kids in her school behind. Only, it's not as Erin had hoped. She has a new rival and she's not even sure why. Enter Jessica, the big, bad, bully that torments and physically assaults Erin every chance she gets. Warning Erin away from Sean. Sean just so happens to be gorgeous and out of Erin's league, or is he? They just so happen to keep meeting at the video store. Is there a reason? This story has several turns and unexpected happenings in it. I loved that is wasn't just another paranormal love story. This story was unique and fresh. The heroine has some emotional damage because of her looks, but through the story we see it starting to heal. I await to see as the story unfolds in the other books how she will gain confidence and find her own peace. Once Erin packed and moved back to her parents hometown, her life finally started to change for the better. She made friends, was finally able to relax, and was even crushing on one super hot guy. Only one thing seemed off, and that was one girl's menacing behavior anytime Erin stepped near Sean. From stolen minutes in movie stores to a wicked confrontation with the bully, Erin's story is an adventure. I was sold on it almost immediately. It is a quick fast paced read that leaves you waiting for the next installment. After the first part in the series, I expected a lot from the second book, and was not disappointed with it! The relations between the persons are deepened, some loose ends get solved and others are created, and some new figures are introduced that play a big role in how the book ends. With a title like "Betrayal" you know something shocking is going to happen, but it still took me by surprise what it was and the reaction of the main figure on the it. But if you see the age of the main character, After the first part in the series, I expected a lot from the second book, and was not disappointed with it! With a title like "Betrayal" you know something shocking is going to happen, but it still took me by surprise what it was and the reaction of the main figure on the it. But if you see the age of the main character, you can understand it. An adult would have reacted differently (at least you would hope so!) You also get a first glimps into the history of the family of the main character, more coming in later books! Betrayal continues where The Beginning left off, and Erin is continuing to try and get to grips with not only her own powers, but with everything that is happening. More characters are introduced in this book, giving it more depth, and I can see these becoming big parts in the story to come. I enjoyed this book even more than the first, probably because the story was already set, and will continue to read to see what comes next for Erin as there are still many questions unanswered. I received an e-copy of the book from the author in exchange for an honest review. My main problem with this book, like the previous one, was the erratic spelling and grammar. At times, I lost track of what was happening and the writing seemed superfluous. Also, there really wasn't much of a plot. But I did enjoy the (view spoiler)[breakup scene (hide spoiler)]. It had it's own unique take on the paranormal genre. It wasn't written as American, so at times a little hard to understand, but was very refreshing. In all honesty, it could use another read through/edit. But it doesn't really take away from the story. I tend to be a grammar Nazi or so I've been told. I love the Yin & Yang of the couples. The story is detailed and is very interesting to read. I will definitely be getting the next book to find out what happens. I LOVED the second install of Erin the Fire Goddess series. It progressed nicely from the first book. The story line was great - simple but thrilling. Erin is so to relate to that you can't help but feels how she feels. The extra characters really helped to develop the story and I'm interested to know where the story will go from here. It is a must read and I am about to start the 3rd one in a few minutes. Having read the first book I was looking forward to reading this book! I loved catching up with Erin and the rest of the gang. Finally Kasey-ray finds her power. I don't like Louise much though and I'm intrigued to see what role Scott plays in it all!! After years being bully and looked over Erin starts the school year off with a boyfriend and feeling good about herself, but like all things it must come to an end. When her worst nightmare walks in, Louise and she wants Sean. The question is will Sean betrayal her and what kind of powers do Louise have ? There is no happy ending here so you will have read book three. This book is of course the 2nd book of the the Fire Goddess series. I found it to be an excellently well written continuation to the the first book. I'm looking forward to seeing what this author writes in the future. Over the years Lavinia has faced many obstacles but this has only spurred her on. In 2017 Lavinia was diagnosed with Metastatic Breast Cancer. She has chosen to not let this d Lavinia originally grew up in Cheshire and now lives in a small village just outside of Edinburgh with her husband, two children and two fur babies.